On November 19, 1863, President Abraham Lincoln dedicated the National Cemetery at Gettysburg, Pennsylvania, with those immortal words: "Four score and seven years ago our fathers brought forth on this continent a new nation...."
Those words, which will probably last as long as this Nation lasts, were spoken to dedicate a cemetery for the Union soldiers who gave their "last full measure of devotion" on Gettysburg's bloody battlefield. But what honor was accorded the Confederate dead? Where were they laid to rest? Following the Battle of Gettysburg, the Confederate dead were buried along the roads, shoved into trenches, or consigned to common graves. The Southerners were seen as traitorous invaders and their bodies were not accorded the respect afforded the men in blue. One newspaper reporter wrote: "The poor Confederate dead were left in the fields as outcasts and criminals that did not merit decent sepulture." President Lincoln's immortal words were not spoken over their unattended, and unmarked, graves. 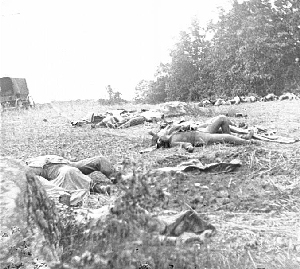 Reacting to the lack of proper burial for these Southern soldiers left at Gettysburg, the Southern states launched efforts to return the bodies of their sons to their native states following the end of the War Between the States. In Richmond, the Hollywood Memorial Association started a fund drive to secure the money to bring the Confederate dead from Gettysburg to Richmond for reburial in Hollywood Cemetery. Their efforts proved successful. On June 15, 1872, a steamship docked at the wharf at Rocketts on the James River with boxes containing the Confederate dead. The soldiers who left Virginia to fight for the cause they thought was just, had come home. No one will ever know for sure, but in one of the precious boxes were probably the unidentified remains of Brigadier General Richard B. Garnett, who was killed while leading his men in what history has labeled "Pickett's Charge." Pickett's Charge, which took place in the afternoon of July 3, 1863, started when General George E. Pickett ordered his men forward yelling, "Charge the enemy and remember old Virginia!" Over 13,000 Confederates emerged from the woods on Seminary Ridge and headed toward the waiting Union forces on Cemetery Ridge, which was nearly a mile away. It was described by a Union soldier as Confederates charging forward "with the step of men who believed they were invincible." Union shot and shell tore into the marchers, but still they came. It was recorded that the battle noise was "strange and terrible, a sound that came from thousands of human throats...like a vast mournful roar." With muskets firing, flags waving, bayonets fixed and swords pointing forward, the flower of Southern manhood moved forward, ever forward. 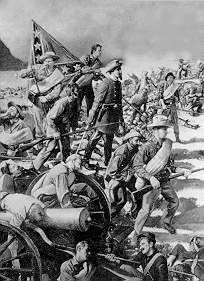 The fighting was bitter as the Confederates flung themselves across a stone wall which separated the two armies. The battle was awesome, the human casualties appalling; and the Union's fate hung on the outcome. It was, however, the Confederacy that died on that stone wall as the men in gray were repulsed by the Union forces. Their charge had failed. General Garnett, who was ill on the day of the charge, led his men into what was described as a mission to "hell or glory." As he plunged with his men through a hail storm of lead, Garnett was ripped apart by grape shot and his body was left unidentified on Gettysburg's field. The honor these dead Confederates were denied in life, they found in death. On June 20, 1872, fifteen wagons were assembled at Rocketts to carry the boxes containing the remains of the Confederate dead. Each wagon was draped in mourning and was escorted by two former Confederate soldiers with their muskets reversed. The funeral procession, which included both political as well as military leaders of the recently defeated Confederate nation, wound its way up Main Street as it moved toward Hollywood Cemetery. The buildings along the route were draped in black, and they echoed to the plaintive sound of the funeral march. As the wagons passed slowly by, "many eyes were filled with tears and many a soldier's widow and orphan turned away from the scene to hide emotion." When the procession reached the cemetery, the boxes were unloaded and buried in a section known as Gettysburg Hill. The soldiers who had escorted the bodies were ordered to "rest arms" as their comrades were laid to rest in Virginia's soil. There was nothing comparable to the Gettysburg Address for these soldiers. There were no memorable orations; only a prayer by The Rev. Dr. Moses Hoge of Richmond's Second Presbyterian Church was spoken. The prayer contained these lines: "We thank Thee that we have been permitted to bring back from their graves among strangers all that is mortal of our sons and brothers." Dr. Hoge prayed for those who had survived the war and then intoned, "Engrave upon the hearts of...all the young men of our Common- wealth the remembrance of the patriotic valor, the loyalty to truth, to duty, and to God, which characterized the heroes around whose remains we weep, and who surrendered only to the last enemy...death." Following the prayer, three musket volleys were fired in a final tribute to those whose bodies were laid to rest for all eternity on Hollywood's sacred hill. The sounds of the muskets echoed across the cemetery, across the River James, and they still echo today across the pages of history.